The beautiful weather yesterday had me dabbling into some Spring-ier recipes for dinner- Lemon and Herb Grilled Salmon, Carrot and Lentil Salad, Lemon Sautéed Spinach and some Olive Oil Herb Bread. All of these were new recipes and I’ll make all of them again… especially the salmon. All these dishes had a Mediterranean/Greek flare to them and there were a lot of shared ingredients. If I weren’t making the bread (which I rarely do, but it was so good I may do it more often), this could totally be done on a weeknight. But the bread required (according to the recipe) 4 hours of “rising” time, which I just did not plan accordingly for… therefore I skimped a little and made it happen in about 2 1/2, and it still tasted great and the texture was exactly what I hoped for it to be. Anyways, I’m getting pretty pumped about spring and sharing some more of my lighter dishes. Hope y’all enjoy this one! 1.) Preheat grill over high heat. Place salmon fillet in a casserole dish. Pour olive oil over fish, add garlic and lemon zest. Using the back of a spoon, spread out the olive oil, garlic and zest so that it evenly covers the fillet. 2.) Sprinkle oregano, dill, salt and pepper over the salmon (see pictures below for about how much). 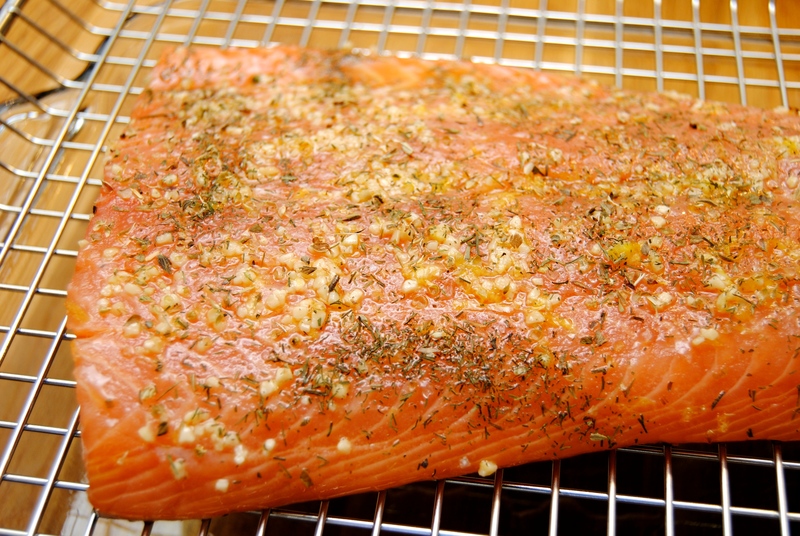 Let salmon sit at room temperature for 15 to 20 minutes prior to grilling. 3.) 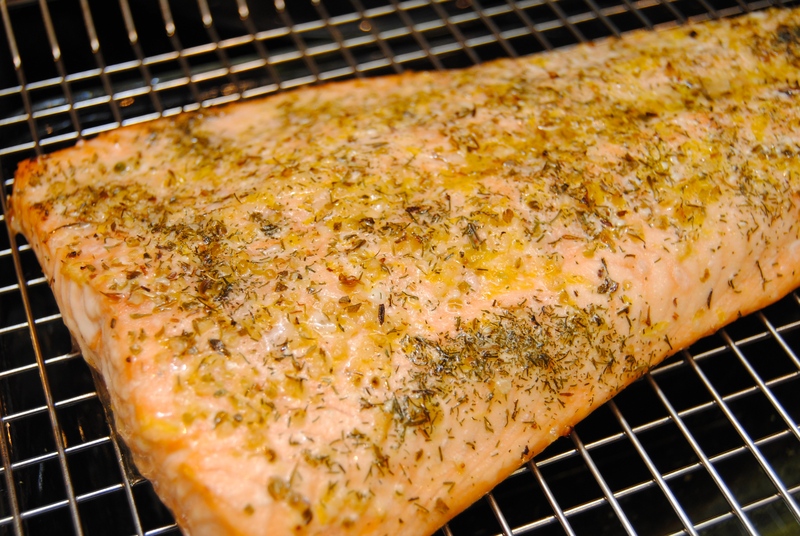 Place salmon on a grilling rack (to prevent it from sticking to grill), skin side down. Place rack on grill and close lid. 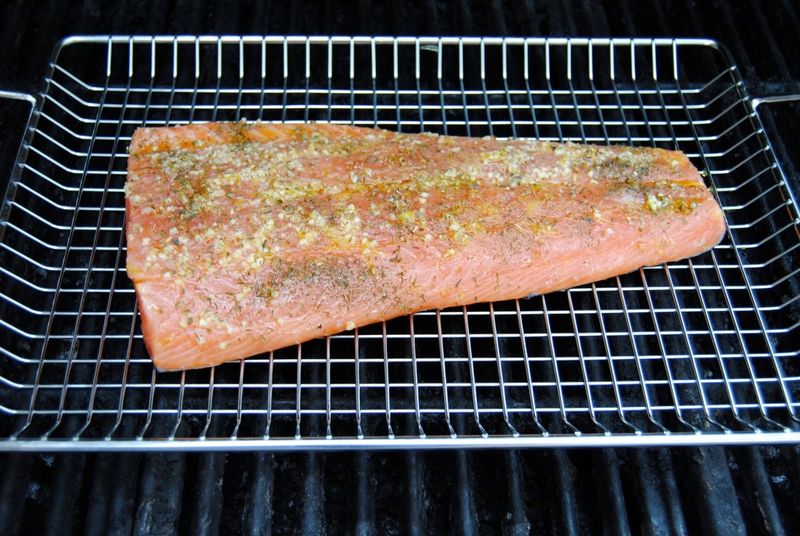 Grill for about 10 minutes (if salmon is about 1-inch thick). 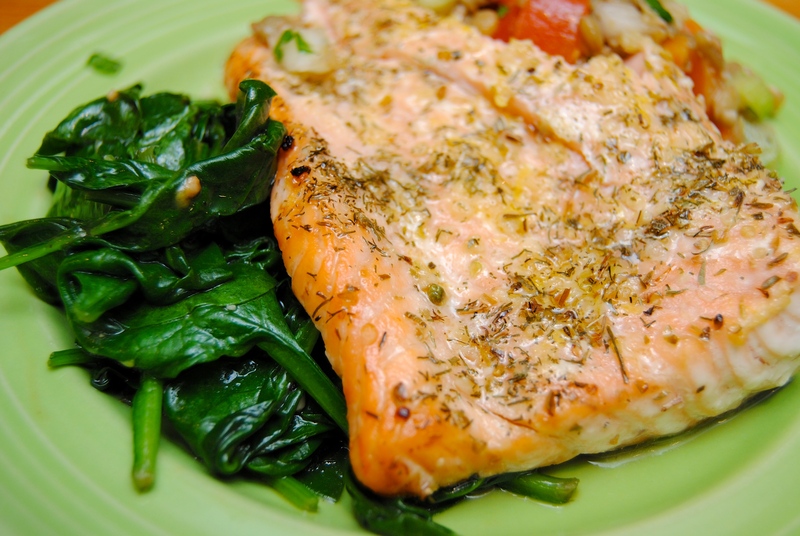 If salmon is thicker, it may require more time. 1.) Place carrots and lentils in a medium sized sauce pan. Add enough water to cover lentils and carrots by about 1 inch. Add garlic, thyme and bay leaf. Bring to boil, reduce heat to medium and simmer uncovered for about 20 minutes. 2.) Remove bay leaf and drain water by pouring into a mesh strainer (you don’t want to lose all the garlic or thyme). Place back in pan and add remaining ingredients. Stir well and place in the refrigerator to cool. 1.) In a large pot heat olive oil over medium-high heat. Add garlic and sauté for about a minute, stirring constantly as to not burn the garlic. Add spinach, lemon zest, salt and pepper. 2.) Stir constantly to make sure spinach doesn’t stick to bottom. Remove from heat once spinach is mostly wet and wilted looking. It will continue cooking once removed. 1.) Stir yeast, sugar and 1/4 cup warm water in the large bowl of a stand mixer. Let sit until foamy, or about 5 minutes. 2.) 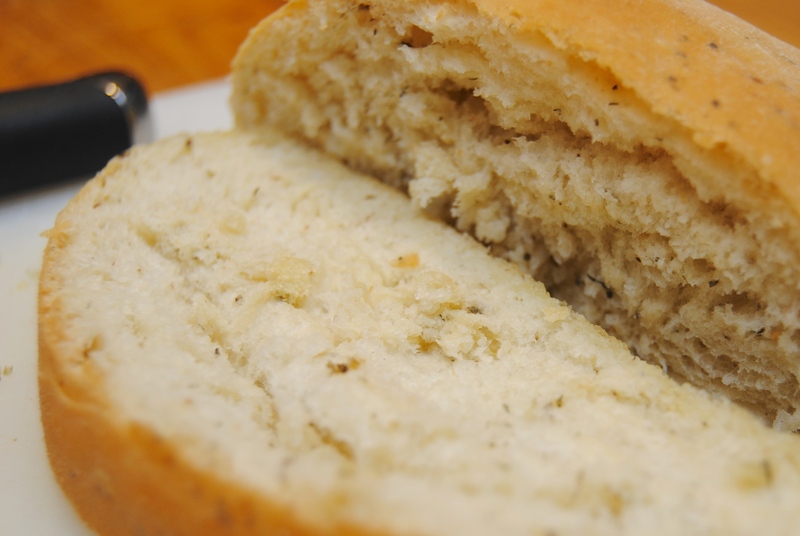 Add the 1 tablespoon of olive oil, flour, herbs, salt and 3/4 cup warm water. Knead using the stand mixer’s dough hook attachment on the stir setting until dough forms. Turn speed to medium for about 5 minutes. Add a little more flour if dough sticks to the sides. 3.) Brush a large bowl with olive oil. Place dough in the bowl, cover with plastic wrap. Place in a warm place in kitchen (I have under cabinet lights that provide some warmth) and let it sit for about 1 1/2 hours (dough should have doubled). 4.) Remove dough from bowl and place on a floured surface. Cut dough into 4 equal sized pieces. Working with one piece at a time fold top of dough up and over, and bottom of dough up and over. Do the same thing to the right and left sides until you have something that resembles a square. Turn dough over so that the seams are on the bottom and tuck the “corners” under. Dough should be in the shape of a ball with the smooth surface up. Place on a large cooking sheet coated with olive oil. Repeat with the remaining dough pieces. 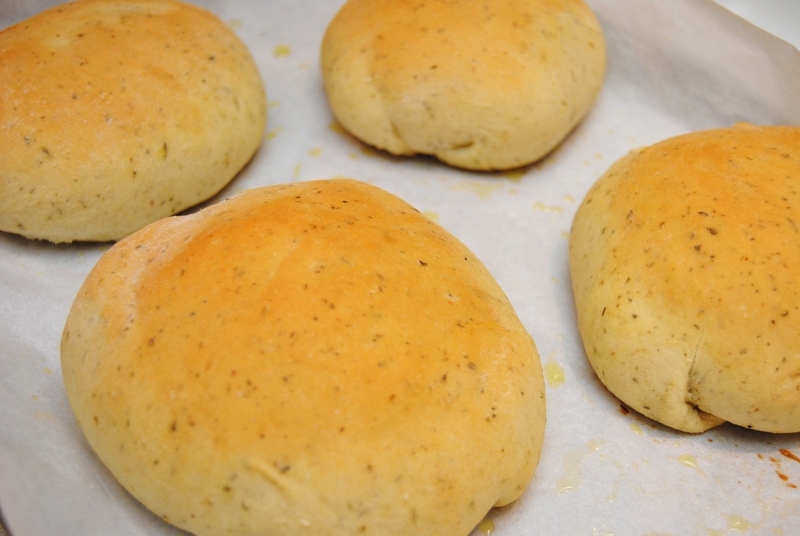 Make sure there is about 5 to 6 inches between each dough ball on the sheet, if not, use 2. Let dough sit in a warm spot (I placed it on the stove top as I preheated the oven to 400 degrees) for about an hour. 5.) 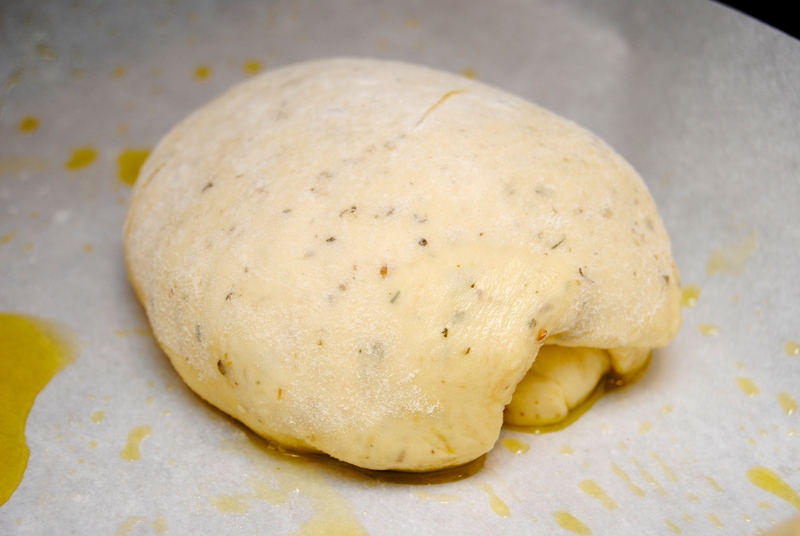 Bake dough for 10 minutes, remove, brush with olive oil (and salt and herbs if desired) and place back in the oven for 10 more minutes. This entry was posted in Food and tagged Bread, Carrot and lentil salad, Cooking, Dinner, Food, Grill, Herbs, Lemon, Lentil, Salmon, Spinach by biscuitsncrazy. Bookmark the permalink. WOW! Want everything in the pictures! Thanks for sharing your recipes! This came at the perfect time when my mom wanted to make me a birthday dinner and I didn’t know what to tell her until I saw your beautifully cooked salmon. Thanks for the inspiration!